Cropped scan of back cover of Penguin No.642 (unattributed image). Sylvia Townsend Warner was an only child who was educated at home, and she became an accomplished musician at a young age. At the outbreak of World War I, she went to work in a munitions factory in London, and began to write fiction. In 1930, she bought a cottage in the village of Chaldon Herring in Dorset, where she lived with poet Valentine Ackland for the rest of her life. 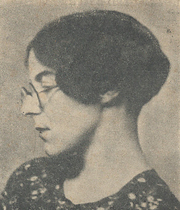 During her career, Sylvia produced seven novels, including Lolly Willowes (1926), Summer Will Show (1936), The Corner that Held Them (1948), and The Flint Anchor (1954); four volumes of poetry; a volume of essays; and eight volumes of acclaimed short stories; as well as a biography of T.H. White. The Diaries of Sylvia Townsend Warner, published after her death, contain vivid thoughts and reactions to the events of the London Blitz and World War II in general. She also translated Proust's Contre Saint Beuve into English. Sylvia Townsend Warner is currently considered a "single author." If one or more works are by a distinct, homonymous authors, go ahead and split the author. Sylvia Townsend Warner is composed of 12 names. You can examine and separate out names.